For courses in personal health. Health: The Basics aligns well-researched health information with current real-world topics that have the greatest impact on students’’ lives to keep them hooked on learning and living well. The 13th Edition integrates mindfulness research, tools, and practices throughout, enabling students to incorporate mindfulness practices to help cut through the static of everyday life, to be more focused and present, and to improve academic performance. Along with new content on sleep and health, as well as diversity and health equity, Health: The Basics builds on its strengths of using the most current, scientifically valid research, examining important issues and controversies about health today, and motivating students to become “actively engaged in health” at all levels. Mastering™ is the teaching and learning platform that empowers you to reach every student. By combining trusted author content with digital tools developed to engage students and emulate the office-hour experience, Mastering personalizes learning and often improves results for each student. With a variety of activities available, students can actively learn, understand, and retain even the most difficult personal health concepts. Pearson eText allows educators to easily share their own notes with students so they see the connection between their reading and what they learn in class–motivating them to keep reading, and keep learning. Portable access lets students study on the go, even offline. And, reading analytics offer insight into how students use the eText, helping educators tailor their instruction. Learn more about Pearson eText. Note: You are purchasing a standalone product; Mastering Health and Pearson eText do not come packaged with this content. 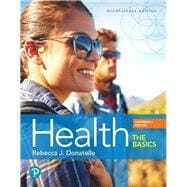 Students, if interested in purchasing this title with Mastering Health or Pearson eText, ask your instructor for the correct package ISBN and Course ID. Instructors, contact your Pearson representative for more information. Rebecca Donatelle has served as a faculty member in the Department of Public Health, College of Health and Human Sciences, at Oregon State University for the last two decades. In that role, she has chaired the department and been program coordinator for the Health Promotion and Health Behavior Program (bachelor’s degree, master of public health, and PhD degree programs), as well as served on over 50 national, state, regional, and university committees focused on improving student academic success and improving the public’s health. Most importantly to her, she has also taught and mentored thousands of undergraduate and graduate students. Dr. Donatelle has a PhD in community health/health promotion and health education, with specializations in health behaviors, aging, and chronic disease prevention, from the University of Oregon; a master of science degree in health education from the University of Wisconsin, La Crosse; and a bachelor of science degree from the University of Wisconsin, La Crosse, with majors in health/physical education and English. In recent years, Donatelle has received several professional awards for leadership, teaching, and service within the university and for her work on developing nationally ranked undergraduate and graduate programs in the health promotion/health behavior areas. Her primary research and scholarship areas have focused on finding scientifically appropriate means of motivating behavior change among resistant populations. Specifically, her work uses incentives, social and community supports, and risk communication strategies in motivating diverse populations to change their risk behaviors. She has worked with pregnant women who smoke in an effort to motivate them to quit smoking, obese women of all ages who are at risk for cardiovascular disease and diabetes, prediabetic women at risk for progression to type 2 diabetes, and a wide range of other health issues and problems. Earlier research projects have focused on decision making and factors influencing the use of alternative and traditional health care providers for treatment of low back pain, illness and sick role behaviors, occupational stress and stress claims, and worksite health promotion. More recently, through her writing she has been working to provide scientifically defensible, engaging ways to help students understand today's complex health and health care challenges, to ask the tough questions, understand that there are often no simple solutions to the myriad of issues we face both in the US and internationally. With this text in particular, she has worked to motivate students to approach their challenges in a mindful, thoughtful way; to take time to notice and to look within and outside themselves in order to really see, hear and feel the life experience to act compassionately toward self and toward others who are struggling with personal challenges. Importantly, she challenges students to ask..."How can I make the world a better place, for me.. for others, and for future generations?...to live more healthfully, and with more enthusiasm?" Whether it be working to improve personal health behaviors, help others who are struggling, or working to improve the social, political, and macro health environment, her goal is to motivate students to become more engaged and be the health change agents of the future. In addition to her 'writing', Dr. Donatelle enjoys playing acoustic guitar, gardening, camping and socializing with friends and family, and walks with her three rambunctious Westies.